ART OF TRANSIT: Panelists speak at the Social Media Week forum hosted by Metro earlier this week on the agency’s use of social media and other rider issues. Click above to listen to the panel! In this opinion piece, Matthew Fleischer says that it makes sense to upgrade the Orange Line to rail — as an increasing number of people say is necessary. But it would be expensive, he notes, and that it may make more sense to simply run express buses similar to the express subway trains in New York (and elsewhere). Buses, unlike trains, have the maneuverability to pass one another easily. To hop on at Chatsworth and take the bus all the way to North Hollywood means making 16 time-consuming stops. An express route could potentially save huge amounts of time for riders at the tail end of every route. An express bus from North Hollywood, for instance, could potentially skip right to Reseda, while another local bus leaving at the same time could service the stations it passed over. If the express bus catches a local bus in front of it, it can simply pass by and continue on its direct route — unlike a train. 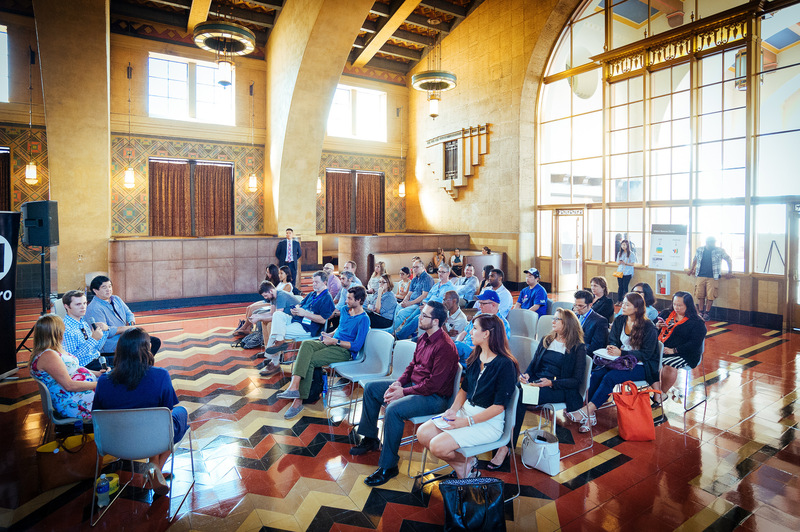 Los Angeles is in the midst of a public transportation revolution. Rail projects like the Expo Line and the “subway to the sea” may one day reinvent the way Angelenos interact with their city. The San Fernando Valley absolutely deserves to be part of this revolution. The Metro Board this summer approved a motion asking Metro staff to explore a number of improvements, including a potential rail conversion. Metro staff responded with this preliminary report outlining some short- and long-term fixes that should be studied further. Not on the list: express buses. The short-term fixes, not surprisingly, largely involve trying to get more green lights for the Orange Line, which often finds itself having to stop at station platforms and most cross north-south cross streets. If you’re interested in this issue, see the staff report at the above link. Pretty interesting discussion and it will be intriguing to see if the issue of express buses is raised by others. Intriguing post about a potential transit tunnel under the Sepulveda Pass and the many possible future transit and/or light rail lines that it may serve. A lot of what is shown on the map are project that aren’t in Metro’s long-range plan — meaning there’s no funding or planning in the works — but it’s still fun to contemplate. The blog post certainly hits the nail on the head by saying that a Sepulveda Pass transit tunnel would only get chance to get it right, meaning it really needs to be able to accommodate whatever the future holds, transit wise. As many of you know, the Sepulveda Pass Transit Corridor is a project set to receive about $1 billion from Measure R. But it’s also a project not scheduled to be completed until the late 2030s and vastly more funding would be needed to build a tunnel, if that option is pursued. Metro has done some preliminary studies of possible concepts and is looking at a public-private partnership to fund the project, although nothing is for certain at this point. Good coverage of President Obama’s speech Tuesday at the United Nations in which the President said climate change is undeniably happening, that it’s the most consequential issue of the 21st Century and that we’re dangerously close to saddling the next generation with the irreparable problems of global warming. Of course, one big problem involving the U.S. entering into any kind of climate treat is…that the U.S. Senate requires two-thirds approval of such treaties. That seems unlikely to happen, with neither political party above to get two-thirds of the Senate’s seats (putting aside the partisan divide on the issue). As we’ve noted before, transit is a good way to try to reduce your own carbon footprint. While transit is also often powered by fossil fuels (compressed natural gas on buses and coal to create electricity that powers trains, for example), transit generally uses those fuels more efficiently than people driving alone in your average car. In other words, don’t wait for the politicians to solve this problem — take the first small steps yourself. In fact, thousands of people just did that by taking to the streets in a number of cities, including Los Angeles and New York, in last weekend’s climate marches. 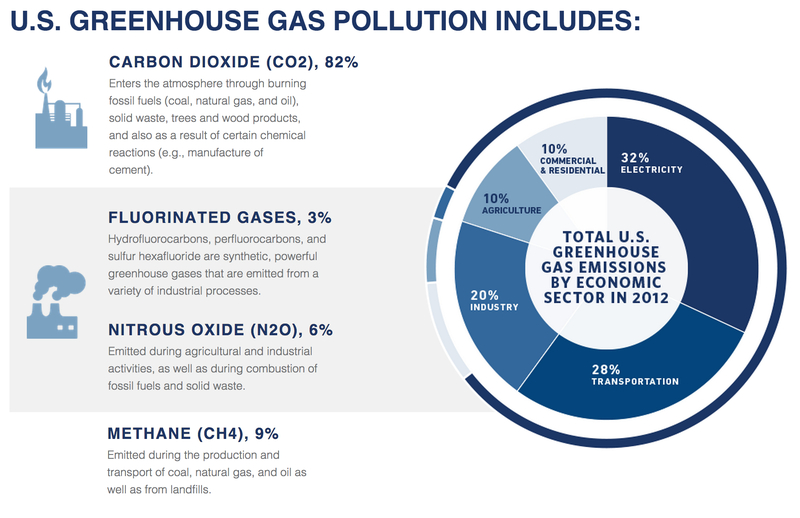 Please see the White House website for good charts and some proposed solutions to reducing greenhouse gases in the U.S. The busiest railroad bridge in the western hemisphere is the Portal Bridge over the Hackensack River in New Jersey. Completed in 1910, it is near the end of its useful life and the cause of many transit delays (the bridge swings open to allow boats to pass). Rebuilding or replacing it is an expensive proposition to the tune of $900 million and like so many transit needs in America, no one knows where the dollars will come from. White House officials, New York City’s mayor and New York’s governor all said there is no credible information about an impending attack on the New York subway system. Iraqi Prime Minister Haider Abadi had earlier told reporters at the United Nations that ISIS militants in Iraq and Syria were behind the threats. I think the main point is this: in the world we live in these days, it’s always best to say something if you see something. The Los Angeles Sheriff’s Department can be reached at 1.888.950.SAFE (7233) — it’s a good number you should save in your cell phone. If underground and you can’t get a cell signal, please use emergency phones that are located on station platforms or press the emergency button to speak to a train operator. You may also want to check out the TransitWatch app to report security and safety issues on the Metro system. The original Prop. A map from the 80’s showed a line running from the valley to the South Bay and Long Beach via the 405 corridor. Has Metro studied using things like Community Facilities Districts or county general obligation bonds for funding? There seems to be an assumption at Metro that transit tax = sales tax, but where land values benefit from Metro projects, something property based would seem to make more sense. With the same 2/3 threshold for both, seems like it’s an avenue worth exploring. I believe former Assemblyman Mike Feuer did look into CFD’s in the run-up to Measure R as a possible funding source for subway expansion. If I recall — and it’s been a while — the issue was that CFDs couldn’t raise nearly enough money for a big pricey project. Still an intriguing idea for a variety of things, however — and I think that’s what they did for the L.A. Streetcar. Currently not too many riders could benefit a non-stop bus ride from NoHo to the end of the line. I wonder can Metro lower the Orange Line fare to 25 cents per passenger so that it could draw even more riders to ride the line. When ridership is increase, then Metro should implement non-stop express bus service. Just in case if there is still low ridership for the non-stop service by then, Metro could implement a limited stop service so that the buses only stop at the Metro Rapid Stops and the stops near the two colleges. This type of strategies could draw more motorists to ride the line. This is a numbers’ game. Increase ridership could be justifiable to make grade separation crossings at busy intersections. Problem is that you need fare money to pay for operations. Sadly, LA Metro’s dismal farebox recovery ratio is so low that it covers less than 30% of operations. Yet, in places like Japan, they manage to get over 100% farebox recovery ratios that fares pay for operations, plus money left over for other upgrades. The difference? LA Metro runs on a flat rate system which discourages short trip riders, Japan runs on a distance based system which encourages short trip riders. People in Japan actually use trains and buses to go shopping for groceries. We don’t. Try thinking about why. It is the question of which one comes first (the eggs or the chickens)? When a transit line’s capacity is completely maxed out. It would be easier for Metro to look for funding. Right now, I don’t see the Orange Line is maxed at all. Buses are only full half west of Reseda Station. Maybe 25 percent of the buses should be turned around at Reseda and return them back to North Hollywood during the off-peak hours. Didn’t Metro already try Orange Line express busses and found that they were unpopular? Hwew we go again….some industry heckler is pushing buses as the best form of public transportation! Don’t these people realize that a bus is just another automobile that contributes to our traffic problems? In fact, the exclusive use of buses contributes to an over-proliferation of private cars, which in turn leads to the construction of more of those Hitleroidal monstrosities known as “freeways” which in turn lead to less living space for the human race (and the attendant eliminatiion of the human scale and comfort which is readily found in rail-based cities), which leads to an egregious waste of our precious natural resources. Sure, rail transportation may cost more to construct initially, but automobile supporters never mention that, in the long run (the life cycle) their vehicles guzzle money which add up to much more than the initial cost of a rail system, often ten to twenty times as much. Also, as I’ve mentioned previously, rail vehicles, and the tracks they roll on, outlast ANY of the three types of automobile (car, BUS,(and truck)). so, who’s trying to decieve who here? Furthermore, the electricity (generally) used by trains can be generated by any energy source; buses must use some type of fuel, which they must carry on board with the passengers, incurring a serious energy penalty which is NEVER suffered by electricallly-powered rail vehicles. Transit trains generally use electric motors which rotate like the wheels they power; the automobile uses an inefficient reciprocating engine whth literally thousands of points of wear, which makes it extremely high-maintenance. Still further, the engine, in order to power the wheels, needs a transmission; this is usually a gearbox which in itself needs constant maintenance. Also, what about those damned rubber tires which need replacement every 2000 miles or so? Haven’t these automobiliated morons even thought these things through?